At Girls on the Run we inspire girls to recognize their inner strength and celebrate what makes them one of a kind. Trained volunteer coaches use our research-based curricula to teach foundational lessons through dynamic discussions, activities and running games. Over the course of the ten-week program, girls develop essential skills to help them navigate their worlds and establish a lifetime appreciation for health and fitness. Our program culminates with girls positively impacting their communities through a service project and being physically and emotionally prepared to complete a celebratory 5k event. The 10 week program is for girls in 3rd, 4th, and 5th grades. Practice Times: Tuesdays and Thursdays 2:30 pm – 4:00 pm. Practices will begin on 3/19/19 and conclude the first week of June. Program Fee: The full program fee is $145. GOTR-Maine uses an Income Based Sliding Scale to determine the participant fee and financial assistance. The scale ranges from $20 - $145. 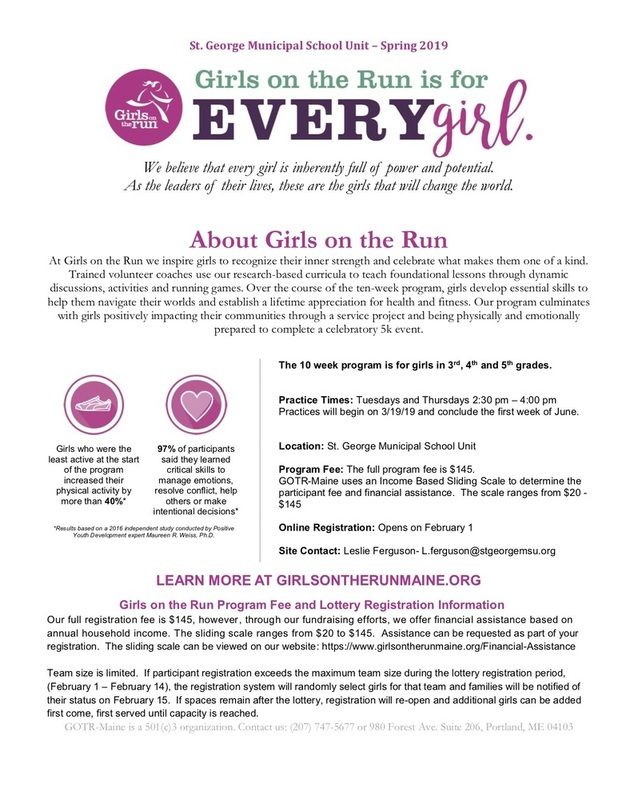 Girls on the Run Program Fee and Lottery Registration Information: Our full registration fee is $145, however, through our fundraising efforts, we offer financial assistance based on annual household income. The sliding scale ranges from $20 to $145. Assistance can be requested as part of your registration. The sliding scale can be viewed on our website: https://www.girlsontherunmaine.org/Financial-Assistance.